Last month, ATZ wrote about Faber’s fabulous Fascination sign going dark and being dismantled. The Coney Island arcade lost its lease after more than 60 years, a casualty of Thor Equities’ plan to demolish the historic Henderson Building. ATZ checked out a couple of Fascination parlors from East Coast to West where you can admire their splendid signage and play the game described as a combination of skeeball and bingo. Fascination at Nantasket Beach in Hull, a seaside town south of Boston, was owned for 60 years by town selectman Leonard Hersch. “He bought the equipment from a Goldman in Coney Island in 1945,” said Jim, who has worked at the Fascination parlor for two decades. As we chatted with Jim on the phone, we could hear the din of the game parlor. Somebody won, and he interrupted our conversation to call out on the mike: “Give her five dollars!” That’s right, you can play for money in Massachusetts! Jim told us: “Our lit sign passed away but we have a sign in big red letters.” In James Young’s photo at the top of our post, you can see all the signage on the front and how inviting it looks: How to Play Fascination: Bingo with Lights Regular Game… First Player to Light Five Lights in Any Straight Line Is the Winner… COVERALL Light all TWENTY-FIVE LIGHTS and you’re the Winner! Winning table remains Lit, all others go out. Win Cash Prizes! Nantasket Beach was once home to Paragon Park, which closed in 1984. The 1917 Giant Coaster was dismantled and sold to a park in Maryland (now Six Flags Great America) and the property was developed into beachfront condos. All that remains of the boardwalk attractions are the antique carousel, clock tower and a few arcades including the Fascination Parlor. Richard Lawrence, who also operates the Dream Machine Arcade and a miniature golf course, manages the place. Today the Fascination parlor boasts two large screen TVs, so regulars won’t miss their football games when they play Fascination. Wine and beer are served as well as complimentary coffee and donuts. The Fascination Parlor is open Friday through Sunday year round. Check out the photos and videos of this local landmark on the website of the Hull Patriot Ledger. The Fascination Parlor in Seaside, Oregon, dates back to the 1950s, according to owner Mark Utti. Now that summer is over, they’re open weekends only: Friday, 4-12 pm; Saturday, 11 am-12 am; and Sunday, 11 am – 8 pm. Here’s a fun video by Charlie MC of three friends playing at the Seaside Fascination in 2009. You may want to turn down the music if you’re at work. on October 6, 2010 at 10:57 am | Reply Lisanne! It’s a little comforting to know that Fascination still exists somewhere. Let’s hope nobody gets crazy ideas about developing what’s left of Paragon Park. The Fascination parlor was lucky to have been owned by a prominent citizen of Hull, who kept it going all these years. I read that he died recently, but new management is in place, so I hope it will continue to thrive. Coming from a Coney perspective, it struck me how just a handful of amusement attractions survived the demise of Paragon Park and subsequent condo-ization of Nantasket Beach. Yet I’d still like to visit the Fascination parlor –it’s like a slice of Americana! on October 6, 2010 at 1:07 pm Lisanne! It’s got my interest too. There are similarities to the fate of Coney Island; much of the original amusement area was converted in the 60s into apartment complexes. This has got me thinking. There’s an irony at work in that Sitt probably wanted to build in the Coney Island amusement area because of its history. But by doing so, he eradicates it. He destroys the very thing he so desired to have. There’s something extremely disturbed about that sort of obsessive and seemingly contradictory behavior. But I guess we knew that already. Thanks for including my photo! And I love the video. I don’t get to Seaside too often so I can live vicariously through the video for awhile…..maybe we should form a Fascination addiction support group…. Seriously, it’s really so sad that these games are disappearing. It seems like a lot of people enjoy them. Thanks again for the photo, marydenise! Hope you get to play the game again soon. Since I did the blog post, readers have told me about the Fascination at Playland Not-at-the- Beach Museum in El Cerrito, CA, though I haven’t looked into whether they’re open year round. And a friend posted a photo of the Fascination at Knoebel’s Park in Pa, which is open through the end of October. Other places where one can play in the summer: Darien Lake Theme Park and Sylvan Beach Amusement Park, both in upstate New York, and Indiana Beach Amusement Park in Monticello, Indiana. Sadly, the Flipper’s Fascination game at Wildwood NJ is no longer open “due to circumstances beyond our control” according to a message on their answering machine. On the Jersey Shore, you can play Fascination at Olympic Fun Center in Wildwood. Fascination is one of the many attractions at Playland-Not-at-the-Beach. During the school year Playland-Not-at-the-Beach is open to the public every Saturday and Sunday from 10:00 a.m. to 5:00 p.m. They are also open during the week for pre–arranged Field Trips, School Visits and private events. They tend to be open on school holidays such as Memorial Day and MLK Birthday. In addition, by special advanced arrangement it can be open any night of the year for parties and events. Playland is open during the summer through Labor Day. Flipper’s Fascination is still awaiting a future re-opening; however, there is Fascination within the Retro Arcade at the Boardwalk Mall, in Wildwood. This was the place created on the HOARDERS tv show, season 4 episode 5. If you want to know all about the real history of the Fascination game, and many of the long since gone Fascination places, there is a great book !!! Fascination The Lifetime Boardwalkl Adventure. Olympic Fascination and Casino in North Wildwood went out of business in September of 2014. It operated about 46 years, burned down in 1979, and was rebuilt. It survived storms and floods, but could not survive staggering rent obligations and ever increasing operation expenses. For anyone who used to play at Olympic Fascination Casino, on the Boardwalk in North Wildwood, and still has Fascination Game Tokens, ( the ones which were purchased to play the Fascination Game ), I am honoring them at my Fascination at the Retro Arcade in the Boardwalk Mall; 3800 Boardwalk, Wildwood. The Mall is not open until May, however, Fascination, and the Retro Arcade, are open each weekend from Palm Sunday until November… use the Ocean Ave street entrance not the Boardwalk when the Mall itself is closed. Prize redemption coupons for Olympic Fascination and Casino were all handled through the Arcade Point Redemption System, and I am told that those who have outstanding Prize Redemption Points can have them honored by bring them to the Arcade in Avalon, NJ, which is owned by one of the former owners of the now closed Olympic Fun Center. The owner is Jared, and he and is wife are very nice people. Even though they lost so much at Olympic, and were forced to close their business, they still want to do what they can for those with Prize Redemption Points. They do not operate a Fascination anymore, which is why I am honoring all Fascination Game Play tokens in my location. For those who love to play the Fascination Game, I hope to serve you and provide a fun time playing Fascination where the game still lives on. Personally, I have ben a Fascination Player for over 40 years, and I played at Olympic as a child. I loved the Fascination Game so much that in high school I had 4 Fascination tables at home which I would play with my friends. 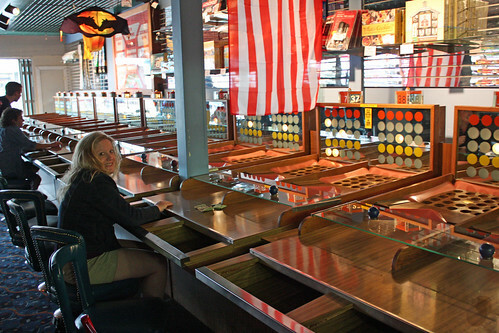 I operated my own Fascination Game on the Boardwalk from age 18 until my present age of 54. As many of the great Fascination Games closed down over the years, I made extreme efforts to purchase and preserve the Fascination Tables, and today I have 8 complete Fascination Game systems in my preserved collection. I was able to obtain the Fascination Tables and Game Systems from Olympic when they closed down in September, and I have them safely stored away for some future use yet to be seen. Fascination is not really gone my friends…. it still lives on, and will be around somewhere for many years to come. For now, we say goodbye to Olympic Fascination on 24 th Street in North Wildwood, and we shall all meet at Lucky’s Fascination just 14 blocks down the Boardwalk at the Boardwalk Mall in the Retro Arcade where you will find all kinds of pinball ball machines and old-time arcade and classic video games from decades gone by. Corner of Garfield Ave… 3800 Boardwalk and also 3800 Ocean Ave with the direct street entrance right into Fascination. Can you hear the balls rolling now?? Please contact me concerning a NEW Fascination. Oh my, I am so sorry to hear this. Our family came once a year just to enjoy that game. I will always have great memories and the fun times we had.